Whether it’s a Starbuck Mocha Frappuccino or a McDonald’s Mocha Frappe, I am completely smitten with the coffee flavored chocolate frozen drinks available on the market. Well, now I have an ice cream that I can keep in my freezer and enjoy those same delicious flavors at home. 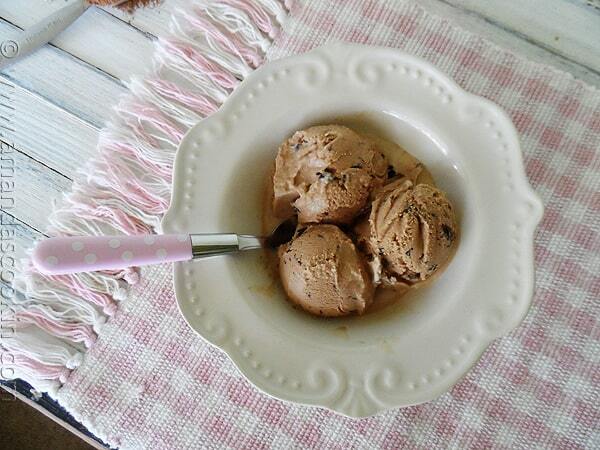 This ice cream is at the top of my favorites list and it’s the epitome of mocha! As you may have guessed, today is reveal day for The Secret Recipe Club. I was assigned to Melissa’s blog, I Was Born to Cook. I loved browsing around Melissa’s place. She’s Mediterranean (Greek and Italian) so it’s no surprise that I would have a tough time picking out just one recipe. Funny thing is I didn’t really pick anything Italian, but I did find that Melissa and I have very similar tastes in desserts! Just like me, she loves ice cream. I found this Pistachio Ice Cream which is on my to do list, and this Cookies ‘n’ Cream ice cream which sounds heavenly too! It’s almost strawberry season here, so these Strawberry Cream Cheese Muffins and these Strawberry Filled Cupcakes caught my eye too. The coffee desserts won me over in the end. While these Cappuccino Brownies were truly tempting, I finally decided on the Mocha Chip Ice Cream. I did make some minor changes to fit my tastes and preferences. While Melissa uses milk and sugar, I like to use sweetened condensed milk in my ice cream. I also combined the coffee, vanilla and cocoa first, then mixed it into the sweetened condensed milk. She also uses chocolate chips, but I love using melted chocolate to make my own, known as stracciatella. This ice cream is amazing, absolutely delicious! It earned a big thumb’s up from everyone in this house and didn’t last more than two days. I’ve made it twice already and they keep asking for more. So thank you Melissa for turning me on to this excellent mocha flavored treat. I am in love! Place sweetened condensed milk in a large bowl. In a small bowl, combine the cocoa, coffee and vanilla to form a thick liquid. 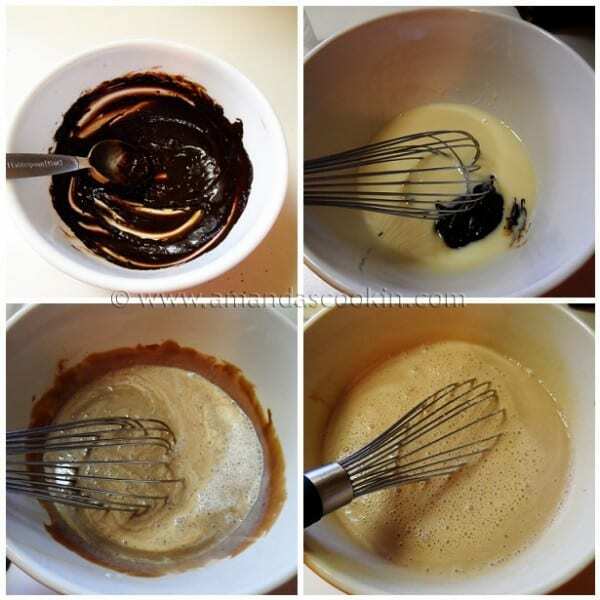 Whisk the chocolate mixture into the sweetened condensed milk. Adding the half and half and whisk to combine. Add the whipping cream and whisk together until all ingredients are combined. Process in your ice cream maker according to manufacturer’s directions. Meanwhile, melt chopped chocolate in microwave on 50% power until smooth, about 2-3 minutes. Place melted chocolate into a zipper sandwich bag to use as a pastry bag. 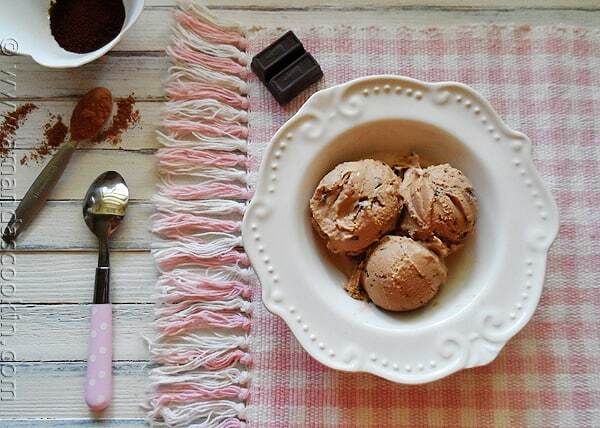 Five minutes prior to the end of churning, cut a small snip in the corner of the bag and drizzle thin lines of melted chocolate into the ice cream. 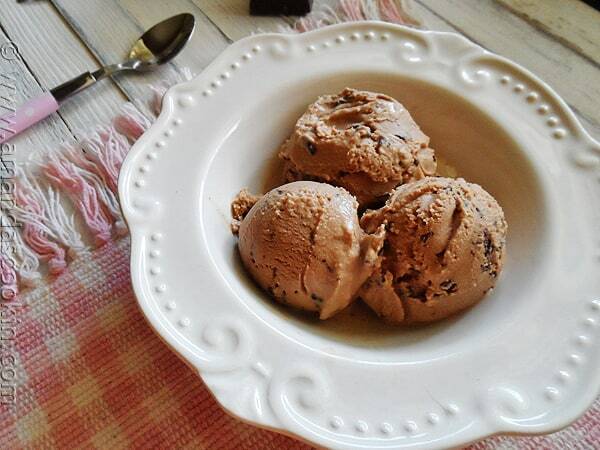 The difference in temperature between the ice cream and the meted chocolate will cause the chocolate to harden and crack, creating wonderful chocolate chips. This method is known as stracciatella. Pour into a covered container and freeze until firm. What is half and half and can I make ice cream without an icecream maker? Hi Honie. Half and half is a mixture of milk and cream. 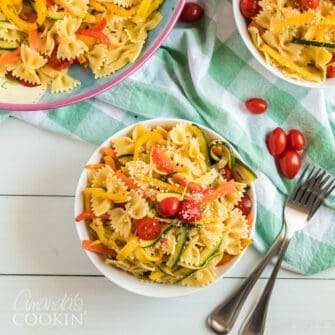 Instead you can use heavy cream and milk in equal parts to equal the amount of half and half in the recipe. To make it without an ice cream maker just freeze it. This looks like the perfect ice cream! 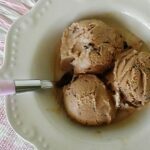 it’s when i see a yummy recipe like this i am so glad that i bought my ice cream maker… i’m going to have to try this one soon! Love this. Really like the consistency of the sweetened condensed milk recipes, too. I made the Mint Chocolate Chip also. Coffee and Mint Chocolate chip have always been my favorite flavors and this hits it spot on! Now if you could only put up a fantastic coconut ice cream and NOT using Coconut cream (we don’t have it in Sweden) then I think I would be in heaven. Thanks again Amanda. I would probably try a basic vanilla first (http://www.eaglebrand.com/recipes/details/default.aspx?recipeid=3990) and add in a small amount of the coconut extract, maybe 1/2 teaspoon. If I remember correctly, it’s pretty strong!